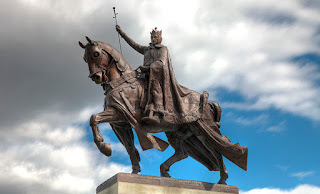 However, there was an extraordinary King of France in the person of King Louis IX, and in fact the Church recognizes him as a saint and heavenly patron of the Third Order Franciscans. It is for his charitable works and care for the poor that he is most often admired. After his release from captivity in battle, he took back to France 300 men who had been blinded by the Saracens and founded the first institute for the blind for their life-long care. He founded theological schools (Sorbonne) and orphanages, and supported numerous religious institutions. He died in 1270 at the age of 56 while on Crusade to rescue persecuted Christians in the East. It was good for him to be the king. August 25 is his Feast Day.